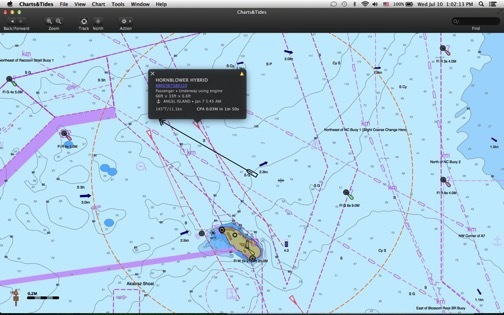 Charts&Tides for Mac with AIS and Canada charts now out! Major new feature: AIS support and Closest Point of Approach (CPA) computations and alerts. Many more connectivity options for GPS (Wi-Fi, GPSD). We now also have Canada charts available as in an app purchase! Read more about them here. A new update has been posted to the App Store and is currently undergoing review. This update brings a major new feature: AIS support complete with CPA computations and alerts. You can even set it so the computer can speak the alerts to you! Available at the App Store soon.